You know I wonder about Al Quedias ability to strike back. Their network has been pretty badly damaged top leaders and many men have been killed. And a few years ago it appeared they were running low on funds. The threat I think will come from home grown terrorists and these will be smaller bombs that will do a lot less damage and be easier to stop than complex well prepared plans from Osama and his ilk. Osama Bin Laden has been killed. Who said you can't take the bin out on a bank holiday...? "no that's you" sigh, go play world of warcraft or something and leave current affairs to people who at least have some basic reading comprehension. Nah, that can be done so much better: "English town councils are in outrage today as US authorities prove it is possible to take Bins out on bank holidays"
Ayman al Zawahiri. The next target? there is just too much crap around, i dont know what to believe. This. Plus there's most likely a load of stuff that we're not being told. I don't trust what any government says on issues like this. For all we know Bin Laden could have been dead for ages, he could still be alive, or they may actually be telling the truth. Whatever the case I'm not believing any statements until evidence is provided to the public. The proof of the attack. The proof that he is dead via DNA testing. Proof to average idiots these days = words of a US administration. I think we have both confused ourselves what were talking about .. lol. My bad if that didn't come across. It's cool, I'm just annoyed with the 13 years olds that think they're geniuses because they found some crappy website. I mean, I'm all for questioning the world around us but some people are just ridiculous. next in command or something? apparently he's less charismatic/enigmatic and by far less popular internally so it's all good. Ok, let's ignore the fact it has been proven by DNA. This action is, by the words of CSI, most likely going to result in attacks. Why would the president of the US make this up knowing how severe the actions could be? The guy had no power. His death is just a symbol. Pretending this 'symbol' has died, and not caring about any attacks that may happen? Sounds stupid. I don't believe in hell. But if there is such a place, he will be feeling hot right about now. I guess when you go to the doctors, you don't believe what they say.. because he doesn't give you whatever proof you need? Silly idiots these days. No proof would ever be good enough for you retards. This, will not end well. 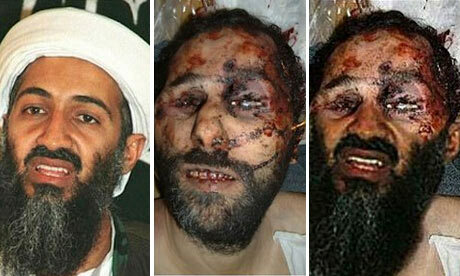 USA got too hung up on finding Osama, when they should have been sorting out the mess they made elsewhere. There will probably be a retaliation. Wow, world or warcraft really? You really know a lot about me. Just as much as you know about osama's death. I can wrap rings around you, go play with 12 years. I don't have time for your ****. And I believe the picture recently released of his body is a fake; it has been merged with another picture of a man from a couple of years ago. Also, why bury it at sea and so quickly without many pictures or footage? It seems Pakistan is also involved more with terrorists than people thought with Afghanistan. And one of the former presidents of Pakistan said the attack was a breach of Pakistan's security.......wtf? The world's most wanted was killed and he said that? Allegedly that's the case, and I hope so. He's still a powerful Emir, and he holds a lot of respect, even though he's insane. I hope he is less popular, though with the death of Osama now, I wonder what will happen to his power base. The organization has taken a severe blow, but they'll come back. There are still influential figures within that group and its splinter factions.